Complainants and witnesses who spoke to the Zimbabwe Human RightsCommission highlighted that armed soldiers and police visited their homes starting the evening of Monday 14 January 2019. They reported a heavy crackdown characterized by indiscriminate and severe beatings. The ZHRC also made home visits to some of those who were assaulted by the police and soldiers. It was noted that their modus operandi was the same in all the communities assessed by the Commission. They would arrive at people's houses at night or in the early hours of the day and ask all men to go outside and lie on the ground. They would then beat up all the men, including boys as young as 11 years, and then ask them to run or arrest them. It was also noted that they targeted those who live in shared residences where there would be different families in one house with more than one male per house. They would also target men and boys who live in houses that are near areas where looting took place or where barricades were set up and just make dragnet arrests without investigating. It was also stated that the police were letting loose their dogs to attack those whom they suspected to have caused mayhem. Some residents reported losing their valuables such as cellphones to the soldiers and the police during their searches of peoples' homes and their property such as doors and windows were destroyed. Some members of the public highlighted that they were scared of reporting the cases to the police as the nearby police stations were barricaded by the army and they also feared that the police would victimize them. Others managed to make reports but were turned away. This implies that those requiring medical attention were/are unable to do so, as the medical facilities often request police reports before attending to them. This impacts on citizens' right to health. Further a police report is required for many other purposes where a crime has allegedly been committed, for example, in order to make an insurance claim. Of concern is the fact that arresting officials in most cases came during the night and refused to identify themselves. The fact that the accused persons ended up in police custody means that these were officers on duty but acting unlawfully and without following due process. The ZHRC therefore calls upon authorities to address this gap before more harm is done to society by criminal elements taking advantage of such actions. In Bulawayo, due to heavy police and military presence in the areas visited, members of the public were uncomfortable speaking with the ZHRC. Loss of Life Unfortunately the disturbances have led to a number of deaths of civilians and a police officer. Whilst the Commission's investigations are still in progress some facts have since been verified. For example, a 22 year old young man, Tinashe Choto died as a result of gun shots and was buried on Saturday 19 January 2019. A post mortem report read to family members by the authorities confirmed the cause of death as gun shots. Eye witnesses confirmed that the young man was shot near Makoni Police station during a face-off between the protesters and law enforcement agents. This is what incensed the protesters leading to the attack of Makoni Police Station. At least 8 deaths have been reported to the Commission and mostly attributed to use of live ammunition. Whilst the police officers in charge were not forthcoming with their side of the story, the verified facts raise a lot of questions around the crowd control capacity of the law enforcement agents. They seem to resort to use of brute, excessive and disproportionate force in most circumstances thereby causing avoidable loss of life and also worsening the situation. 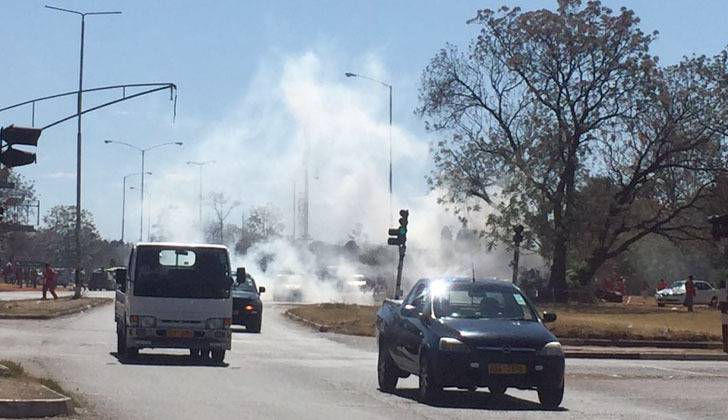 Targeting of Members of the Opposition and Civil Society Organisations (CSOs) The ZHRC noted from its media monitoring activities and complaints received that the Government is blaming the opposition and civil society leaders for the violent protests. The Commission received and verified reports that around the country, some Councilors and Members of Parliament of the MDC Alliance as well as civil society leaders in suburbs where the most damage to property occurred were either abducted or arrested from their homes. At one Councilor's house, children who included a three year old girl narrated what had happened to their father. The three year old girl gave a vivid and moving account of the beatings and arrest of her father during the late hours of the night.